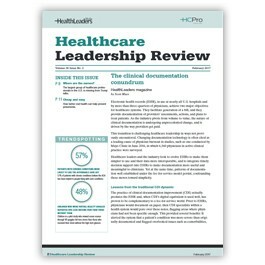 Every month, Healthcare Leadership Review delivers relevant abstracts on the latest industry developments that will keep your hospital or healthcare organization on the track to success. Each month, our editors sift through stacks of healthcare journals, newsletters, magazines, research reports, Web sites, and other resources in search of the topics that matter most to healthcare executives. Healthcare Leadership Review saves you hours of time by unearthing only the most relevant and critical information from these leading resources, and delivering them to you in an electronic format that is quick and easy to read. Tried and true insight from sources you can trust…guaranteed. A subscription to Healthcare Leadership Review guarantees that you’ll get timely, tightly-focused summaries of the most crucial new developments in the field of healthcare management. We’re so confident in this publication that we offer a 100% refund if you’re not completely satisfied. The Washington Post, Wall Street Journal, New York Times . . . Questions? Call toll free 800-753-0131 or e-mail customerservice@healthleadersmedia.com.